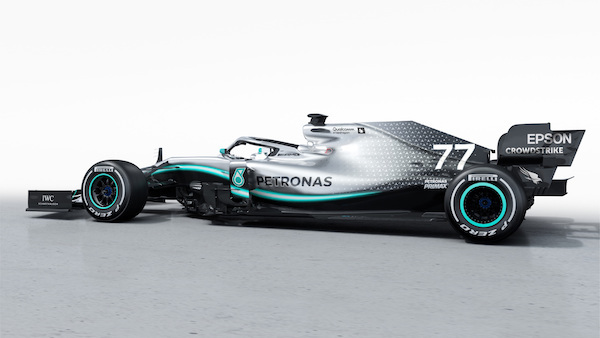 Mercedes-AMG F1 Team has revealed its 2019 Formula 1 car, the W10, whose livery gets a facelift to mark an updated regulatory era. As is true of all 2019 cars, the W10 has wider wings, and a series of other aerodynamic tweaks meant to make closely following another car easier. 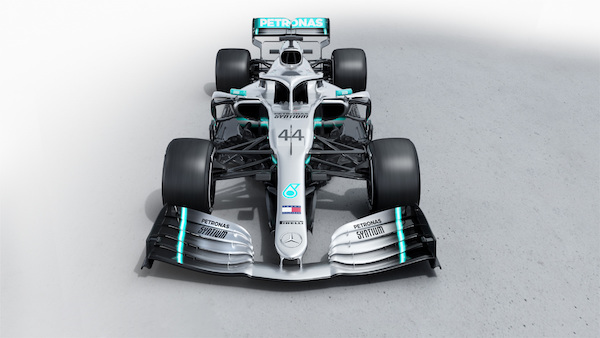 Extra space for sponsors has been freed near the barge boards and on the rear wing endplates, where Mercedes displays two different brands. 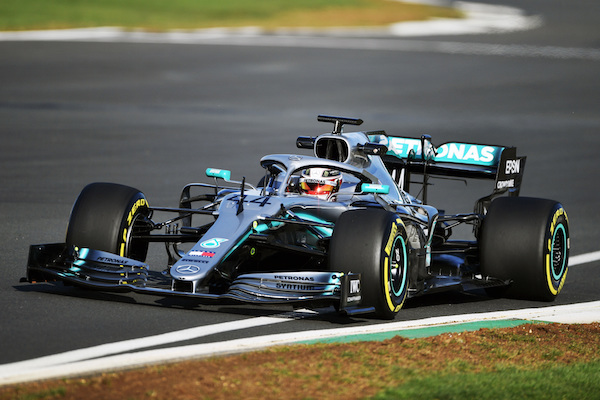 Though in many ways an evolution from the ($400 million) formula that has won Mercedes every World Constructors' Championship (WCC) since 2014, the revised rules have Team Principal Toto Wolff on edge. 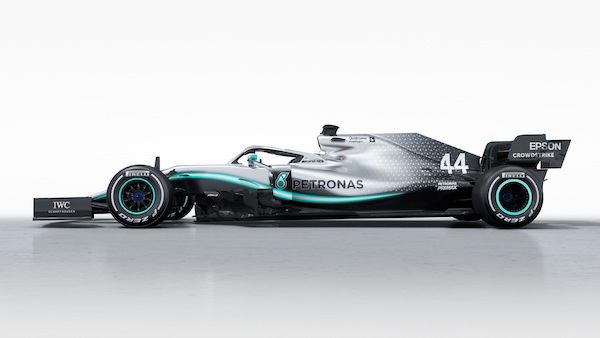 "The 2019 season will be a new challenge for all of us," stated Wolff at the car's reveal. "The regulations have changed quite substantially. We have to start from scratch, we need to prove ourselves again—against our own expectations and against our competitors. We start the season with zero points, so we're taking nothing for granted and there's absolutely no feeling of entitlement to be at the front. In fact, with the regulation change for the new season, every team can have a shot at the title and we're seeing all of them as a potential threat." 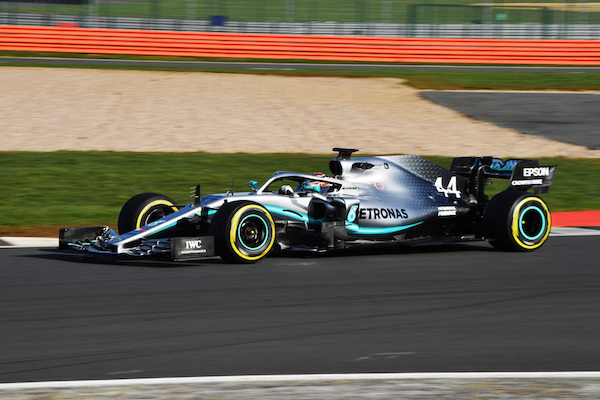 The W10 will be driven by five-time World Drivers' Champion Lewis Hamilton and his multiple Grand Prix-winning teammate Valtteri Bottas. With his win at the final race of the 2018 season, the Abu Dhabi Grand Prix, Hamilton became the first driver to surpass 3,000 career points, as well as 400 points in a season. Bottas had a less memorable 2018 and often found himself on the receiving end of misfortunes when in a position to win a race. With his role at Mercedes in question, the Finnish driver has vowed to give 2019 everything he's got. "This sport is funny, you never know what happens in the future," Bottas told Autosport. "But I think the right mentality for me to approach next year is like I have nothing to lose. I just want to go for it and drive like I stole it, like it's my last race, last day ever. That's a good plan."